Is the Bermuda Pool Model the best backyard above ground swimming pool? The Bermuda Above Ground Swimming Pool is the best quality above ground swimming pool we sell. Please visit our website for this and other cheap backyard swimming pools. 100% CORROSION PROTECTION – Bermuda’s components are made from aluminum that will not rust or corrode like steel. After extrusion, all aluminum panels are powder coated with a beautiful enamel that adds a high gloss luster to its finish as well as further protecting the aluminum from corrosion. All Bermuda’s components are powder coated to insure a beautiful finish that will last for many seasons. From the bottom rails that contact the ground to the rugged top seat, your Bermuda pool is impervious to rust and corrosion. EASY INSTALLATION – Bermuda’s interlocking wall sections make it much easier to install than most convention above ground pools. Because of the superior strength and corrosion protection the pool can also be installed as a semi-inground pool. See our quality features button for details. Bermuda is for the customer that wants only the best in quality, durability and strength. Because of its outstanding features, this above ground swimming pool has a LIFETIME WARRANTY. Bermuda comes standard with a 54” beaded swimming pool liner and a skimmer and return. An installation manual is included with each pool. Who sells the Aruba Above Ground Swimming Pool Kit? Mega Pool and Spa sells the Aruba Above Ground Swimming Pool. HIGH TECH DESIGN AND CONSTRUCTION – Aruba™ pools are constructed of advanced resin and composite materials that make the structure (top rails, uprights, and bottom plates) super strong and also impervious to corrosion. From the internal ribbing in the top seat to the double lock system around the base of the pool, this pool is designed for rugged durability and many years of family fun. And, as an added bonus, the beautifully designed top rail and decorative seat cap give the Aruba™ its designer good looks. 100% CORROSION RESISTANT – The Aruba’s top rails and uprights are made of entirely non-corroding resin. Neither mid-summer sun nor driving rain and ice can cause these members to corrode as they can with a steel pool. Because resin is non-corroding by its very nature, there are no coatings to apply that can eventually chip, crack, or fail. Our Aruba pool gives you the designer beauty that resin affords, plus the added benefit of a corrosion-proof structure that will outlast any steel pool available. EASY INSTALLATION – Invest in our premium Aruba pool this spring and get in on the family fun. Our pools come standard with a widemouth skimmer, and return fitting. A free installation DVD and manual gives you step-by-step instruction, making installation quick and hassle-free. The Aruba is backed by a 60-Year Limited Warranty. Available with a 54″ wall in a variety of round and oval sizes to fit your backyard. Who sells the Tahitian Above Ground Swimming Pool? http://www.megapoolandspa.com sells the Tahitian Above Ground Swimming Pool and ships the pool to you for free. Please visit http://www.megapoolandspa.com to purchase the Tahitian pool. SUPER-STRONG STEEL CONSTRUCTION: Steel is the strongest material used in above-ground construction. The Tahitian uses extra thick gauge steel in its uprights and sidewalls to make this pool rugged and durable. They are backed by a lifetime warranty. The beautiful non-corroding resin top rail is injection molded for super strength and is a true round shape adding a graceful beauty to this pool. Because the top rails are resin, they are softer to sit upon and will not dent like steel top rails. All of these exceptional features are produced with expert craftsmanship resulting in a pool that is not only super strong, but fits together seamlessly with an excellent fit and finish. CORROSION-PROOF PROTECTION: For years pool manufacturers have known that a steel pool is the strongest pool. Unfortunately over time, when exposed to pool chemicals, steel pools have been prone to corrosion. The Tahitian has developed advanced coating techniques that will virtually eliminate corrosion for the life of the pool. The pool wall is protected by a patented PlastiGuard™ coating process that ensures that your outer pool wall will never rust. The patented bottom system which contacts the ground (ice, rain, and snow) will never corrode and is backed by a Lifetime Warranty . Even if steel pools are coated to protect against rust and corrosion, any hole or opening in the steel, such as return lines and skimmer, will open those areas to rust from pool water and the elements. Tahitian eliminates any rust or corrosion with its stainless steel service panel. Every pool comes with the stainless steel service panel that protects the skimmer and return lines from rust and corrosion. This panel is only offered on Tahitian. The resin top rail offers both beauty and function. It’s a true radius design is perfectly round and made of resin that is soft to the touch and will never rust, dent, or corrode. This unique top rail is also impervious to water and chemical damage. Potent U.V. inhibitors imbedded in the resin provide additional protection, insuring decades of family fun. EASY INSTALLATION: Invest in Tahitian this season and get in on great family fun. The pool comes standard with a widemouth skimmer. A free DVD and manual are also included to make installing the pool easy for the average homeowner. Available in a variety of round and oval sizes to fit your backyard. Where can I buy the Agean Above Ground Swimming Pool? The Aegan Above Ground Swimming Pool can be purchased at http://www.megapoolandspa.com and delivered to your home in a few days. 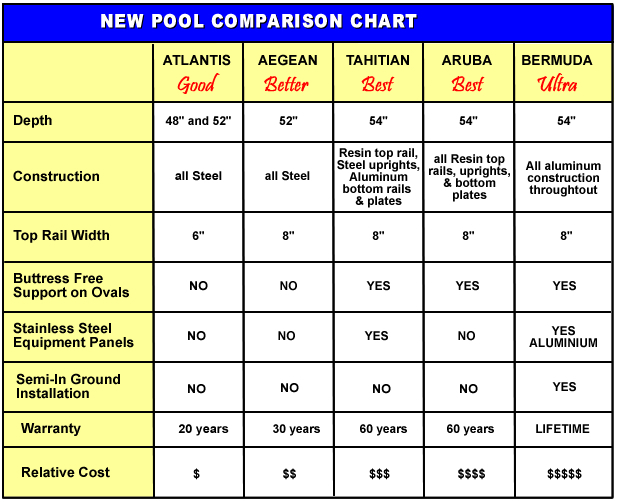 Our quality Aegean steel pool will keep your family splashing for many years. Built by one of the world’s leading pool manufacturers, Atlantic Pools, this pool’s quality and beauty are unsurpassed. From its extra wide 8″ top rails to its heavy duty fully supporting 6″ uprights, the Aegean™ delivers superior quality and craftsmanship. TOP-OF-THE- LINE CONSTRUCTION – Aegean pools are made with the thickest steel of any pool in this class. This extra heavy gauge steel means less bending and warping than pools built with regular weight steel. In addition to its superior strength, it is able to withstand the rigors of freezing winters and heavy snows. Extra wide 8″ top rails and 8″ fully supportive uprights provide a rugged structure that will withstand years of active family fun. The attractive sidewall design combined with the ProtectAll™ decorator resin seat caps give our Atlantis a deluxe upscale look. CORROSION-PROOF PROTECTIVE COATINGS – Our Atlantis pool has many layers of Texture-Kote (on the top rails and verticals) and Protectoloc (on the walls) to protect your pool from rust and corrosion. From blazing sunlight to driving rain and snow, your pool will look virtually brand new for many years to come. EASY INSTALLATION – Aegean pools are designed to assemble quickly and easily by do-it-yourselfers. A free installation DVD is included with each pool to give you step-by-step instruction. Pool set-up is a snap! Invest in our heavy duty Aegean pool this spring and get in on the family fun. Our pools are come standard with a widemouth skimmer, and return fitting. They are backed by a 30-Year Limited Warranty. Available with a 52″ wall in a variety of round and oval sizes to fit your backyard. Where can you buy cheap above ground swimming pools? Mega Pool and Spa sells above ground swimming pool kits at the cheapest price on the internet. Our above ground swimming pool kits can be put together by the do it yourself homeowner. So you can customize the pool how you want it, the pool does not include a liner, pump and filter, ladders, etc. First, select the pool model, add the liner and any installation accessories, and then optional accessory packages such as ladders, cleaners, and season chemical kits. At http://www.megapoolandspa.com, we always have cheap prices on swimming pool supplies. From time to time, we’ll send out coupons for your swimming pool. In order to receive coupons and special offers to use on our website, please provide your name and email address at the bottom of our website. Who has free shipping on swimming pool liners? We do not charge an order handling fee. Our pool liners ship free to the 48 states. Orders sent to Alaska, Hawaii, and Canada are slightly higher. We stock and sell cheap a wide variety of pool liners for above ground and inground swimming pool liners. Our overlap swimming pool liners ship free. We have free shipping on beaded swimming pool liners. Our unibead swimming pool liners ship free. Our J hook swimming pool liners have free delivery. Who has free shipping for Swimming Pool Slides? Most of our swimming pool slides ship via LTL truckline with curbside delivery and can be at your house in just a few business days. With cheap prices and free shipping, we can’t be beat!! You are currently browsing the Mega Pool and Spa's Weblog blog archives for October, 2008.